The WB has released six images from "Just Rewards," the episode of Angel set to air on Wednesday, Oct. 8 at 9 p.m. (ET). 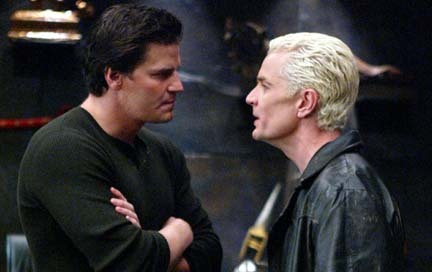 "Just Rewards" is the second part of the two-part fifth-season opener, which brings Spike (played by James Marsters) into the show as a regular cast member. The episode was written and directed by series creator and executive producer Joss Whedon. Click on the thumbnails for larger images and look for more Angel news soon here in The Continuum. The WB has announced that "Phoenix" will be the new episode of Smallville scheduled to air on Wednesday, Oct. 8. * According to an ABC representative, Smallville star Tom Welling will be a guest on The View on Monday morning to help promote the third-season premiere. 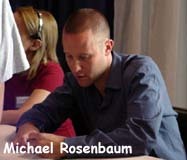 * Michael Rosenbaum, who plays Lex Luthor and also does the voice of The Flash on Cartoon Network's Justice League, will be a guest at the Sci-Fi Summit, Grand Slam XII in Pasadena, Calif., on March 26-28. * Smallville: The Complete First Season is being releaed on DVD by Warner Home Video on Tuesday. For a rundown of episodes on the DVD, CLICK HERE. For covers and four- and five-page previews of CrossGen Entertaiment tiles arriving in stores on Wednesday, CLICK HERE. Titles includes Solus #6 and The Path #17. Patrick Stewart, best known as Professor Xavier in the X-Men films and as Captain Jean-Luc Picard, in Star Trek: Next Generation, will guest star as what NBC describes as a "potential" love interest for Frasier Crane in the Frasier sitcom. The episode entitled, "The Doctor is Out," will air on Tuesday, Sept. 30 on NBC. The Flash #201, featuring the first chapter in the 6-part storyline "Ignition," has sold out at DC Comics. This issue is written by Geoff Johns with art and cover by Alberto Dose. "We're thrilled The Flash is continuing to get people talking," Johns said. "With the 'Ignition' storyline and our plans for the coming months, everyone's in for one great ride." Coming Wednesday: X-Men news -- and much more!! !